Have you ever had an experience that defies rational explanation? Have you ever had a synchronistic moment that defies all odds? Most likely you have, even if you are embarrassed to mention it to anyone. Take time each day to enjoy the mystery of life. Perspective takes the edge off a bad day. Embrace the mystery! A friend sent this link to me. I have had an active interest in Crop Circles ever since I first heard about them. Despite the fact that two guys (Doug and Dave) claim to be making all of these (after a few beers I might add), crop circles made by humans don’t match the intricacies made by “other” forces. While there is much speculation, currently there is no proven answer to how these form, sometimes in less than 3-5 seconds. 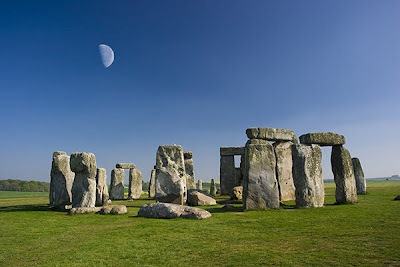 For thousands of years Stonehenge (outside of London, England) has been a mystery to those who gazed upon this structure. How did people transport these monolithic rocks? Why did they build it? What purpose did it serve? I was lucky enough to visit Stonehenge a few years ago during the summer when there were barely any people there. It was a magnificent experience and mystical too. The moon was a real bonus. Enjoy! One cannot address the issue of stress without acknowledging the unconscious mind. After all, the unconscious mind comprises a great percentage of the total mind. One person who devoted his career to the study of the mind was Carl Gustav Jung. A protégé of Sigmund Freud, Jung eventually went his own way and developed a body of knowledge that has worked its way beautifully into the American vernacular: introvert, extrovert, synchronicity and archetypes are just a few of the terms the Jung coined in his study of the mind. Jung was a strong proponent of the message of dream symbols, and spent the majority of his career studying the dreams of his patients, as well as his own. He used the term “psychic equilibrium” to describe a process of learning the languages of the unconscious mind, in this case, the language of dream symbols, to ease one’s level of anxiety. Given the amount of stress people exhibit today, it’s a good practice to follow. Many people, if they can remember their dreams, think they make no sense. From a conscious perspective, this may seem to be true, but from a perspective of the whole mind, nothing could be further from the truth. So…take note of your dreams. Pay attention to the fragments of dream images each morning (perhaps even write them down) and then take the time to decode the message of these symbolic images. The unconscious mind speaks in colors, symbols, myths and stories, rather than words and sentences. Take the time to find and master your psychic equilibrium! This link (below) will take you to a recent online article about a book (the Red Book) that Carl Jung worked on throughout his whole life. In it contains many illustrations of his own dream images and personal reflections. He asked that it not be opened for study until 100 years after his death. He died in 1961, yet many now are hoping to take a peek inside to see what it has to offer on one of the greatest minds of the 20th century. 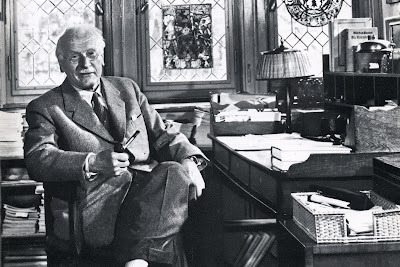 A photo (from his renowned book, Man and his Symbols) of Carl G. Jung in his study of his home in Switzerland. My friend sent this link which I thought was worth sharing as well; its a video clip of a man and a dolphin. Enjoy! Some predict that the day of books is over, with the Internet as a dominant force in our lives. I hope not! I chose to use a photo of books from my library in the hopes that books will never go out of style (and I am not just saying that because I am an author!). 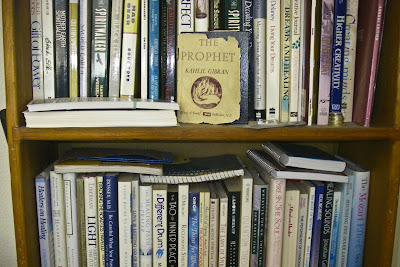 By the way, The Prophet by K. Gibran is a great book. It may seem like a tall order to keep an open mind in times of stress, but an open mind is what often leads you out of a corner that you paint yourself in. Step outside yourself and take a look at things from a different perspective. Quite often there is more than one right answer to a problem, yet you will never find that second (or third) right answer if you don’t step outside yourself (also known as detatching from the ego) to see the bigger picture. Learn to get comfortable with a little gray in between the black and white. Jayne Poynter spent two years in Biosphere 2. This lecture highlights her experiences and it make for some fascinating viewing. Enjoy! 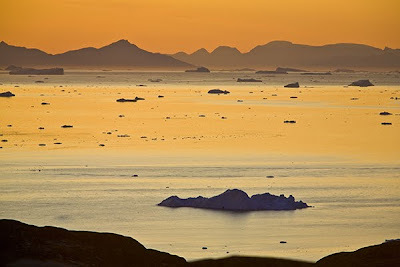 This photo was taken an hour after sunset in the arctic circle of Ilulissat, Greenland during the month of early August this year. It never really got much darker than this all night long. Take inventory of your emotions today. Observe when you find yourself getting anxious, upset, or frustrated. Ask yourself why do you feel this way. Did the winds of change blow across your face (without your permission!). Ask yourself what can you do to positively adapt to the changes in your life so that you are not tossed aimlessly around by these winds of change. Anchoring down isn’t the answer. Going with the flow is! I just returned from a trip to Peru where I hiked the Inca Trail and arrived at Machu Picchu the way the Incas did several hundred years ago. This is the sight I arrived at daybreak on Sept 4th, a few days after my birthday (and I am happy to say that the film footage of the mist rolling over the ancient city at dawn will be in the Earth Songs movie as well.) 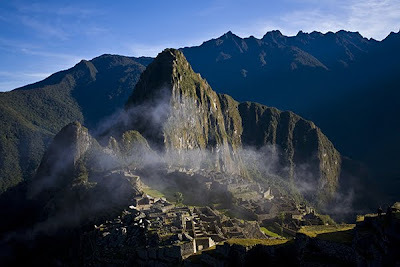 Machu Picchu is a most remarkable and mystical place for sure. Enjoy! Be In This World… But Not Of It! Stress has always been part of the human landscape, but it appears that the rate of change today is fast and furious making stress a greater presence in everyone’s lives. A catalyst for stress is the ego’s attachments to expectations and ideals of how things are SUPPOSED to be. Spiritual traditions from several Eastern cultures remind us of how to “walk in balance” gracefully in times of stress. They use words such as “detach,” “release” and “cleanse;” all means to keep the ego in check when under pressure. A popular expression attributed to a great many spiritual luminaries reminds us “To be in this world, but not of it.” From a stress management perspective, this is a reminder to live our lives in balance, not tension. It is a reminder to let go of thoughts, perceptions and attitudes that hijack our emotions leaving us in a perpectual state of frustration and anxiety. To be in the world but not of it, means to acknowledge unmet expectations, but not give our power over to them. To be in the world but not of it means to take the high road when we encounter stress by letting go of petty annoyances. To be in this world but not of it also means to appreciate material possessions, yet not be consumed by them; an addiction all unto itself. All of this may seem like a tall order, but with practice, it becomes easier. Take inventory of your life today by stepping back (particularly in situations of stress) and observer your life from a new perspective: To be in the world but not of it. Detachment doesn’t mean apathy or indolence, rather it means living a consciously with an open heart. Take a deep breath and remind yourself that you are so much more than your ego! 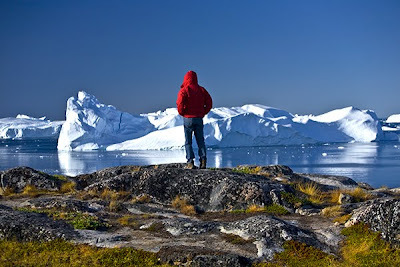 Not long ago I was up in Greenland to film (Earth Songs) the icebergs in the town of Ilulissat, a UNESCO world heritage site. It is impossible to be up there and not hear the buzz of global warming. Below is a link to some research being done in the area, some of which I was able to see myself. I thought this link was worth sharing…. I have been on the road for the past several weeks (Greenland, Hawaii and Peru…non of which were vacations, but just so you know, Hawaii was entirely all work and no play… smile) Today’s photograph is one of my favorites from Greenland. Enjoy! By the way…Plans are underway for a Mountain Retreat workshop next summer in Ireland. For more information/itineray, etc. please call MaryJo Camaren (Sundrenched Vacations) at 303. 439.0948.